Avery Fisher Career Grant winner Benjamin Hochman made his highly acclaimed New York recital debut at the Metropolitan Museum of Art, which was soon followed by engagements with the New York Philharmonic and the Israel Philharmonic at Carnegie Hall. A native of Jerusalem, he was selected to participate in the Chamber Music Society of Lincoln Center’s CMS Two, Isaac Stern’s International Chamber Music Encounters at the Jerusalem Music Centre and Carnegie Hall’s Professional Training Workshops. His numerous engagements at New York’s 92nd Street Y have highlighted a penchant for diverse programming. recitalist, he has appeared at the Concertgebouw in Amsterdam, the Louvre, l’Auditori de Barcelona, the Tel Aviv Museum, New York’s Weill Recital Hall, the Gardner Museum in Boston, the Kennedy Center in Washington DC and Suntory Hall in Tokyo. International festivals include Lucerne, Spoleto, Klavierfestival Ruhr, Prussia Cove, Marlboro, Ravinia, Gilmore and Santa Fe. Mr Hochman is on the piano faculty of the Longy School of Music and Bard College. He studied in Israel with Esther Narkiss and Emanuel Krasovsky and later graduated from the Curtis Institute of Music and Mannes College of Music, where his principal teachers were Claude Frank and Richard Goode. His studies were supported by the America-Israel Cultural Foundation. Homage to Schubert is Mr Hochman’s second solo recital recording – his debut recording of works by Bach, Berg and Webern was released by Artek in 2009. 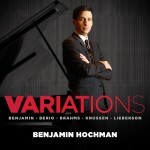 Benjamin Hochman is a Steinway Artist and his website is www.benjaminhochman.com.